In the years that broadband service has been subjected to relatively little regulation, investment and deployment have flourished and broadband competition has increased, all to the benefit of consumers and the American economy. And it hints that such investment would somehow go away with reclassification. Of course, this is all a lie. In part, because Wall Street hates capital expenditure and gets angry any time broadband providers actually invest in broadband, these companies have actually been doing everything possible to decrease how much they spend on infrastructure investment over the past five years. Even worse, they're playing stupid statistical tricks to try to hide it. Thankfully, Matthew Yglesias, over at Vox.com calls them out on this. 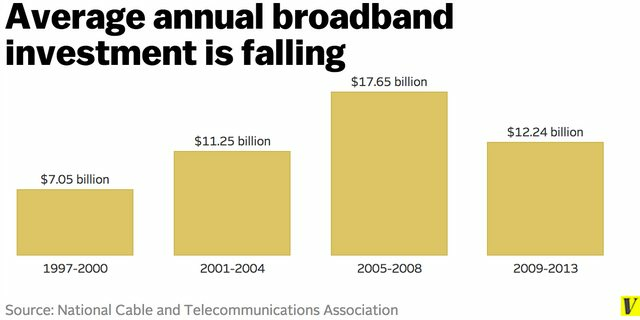 The big cable lobbying organization, NCTA, pulls two tricks with the following chart that it uses to falsely pretend that broadband investment is increasing: First, the more obvious trick is that those numbers are cumulative -- which is what you generally do when you want to hide the actual rate of investment per year. But the rate is actually slowing down quite a bit. The second trick is more subtle. Note that there are three years between each of the first four numbers? But between the second to last one and the last one, there are four years. That's because the actual numbers would show pretty clear decline in investment, so they're fudging it by combining cumulative totals and then adding an extra year to that last number. Yglesias then used that data to calculate the actual averages showing a more accurate picture: As you can see, it certainly suggests that, as they've grown more powerful, and as real competition has decreased, investment has been cut back significantly. That fits with plenty of other evidence concerning how the major cable and telco companies have acted. That story about "greater competition" is -- as we've discussed previously -- a complete joke. That's fudging statistics in a different way, lumping in totally non-competitive wireless accounts, which can't be used as broadband replacements. Update: NCTA has responded to Yglesias's article, claiming that "the [original] chart had a few simple errors" which it claims to have now fixed. 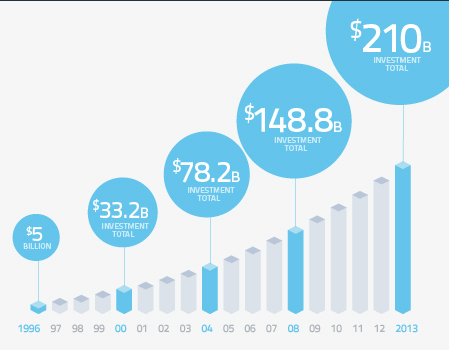 It also posted a new chart with yearly data, which still appear to show a decline from peak investment, though NCTA tries to spin at as continued growth in investment. It does appear that there are cycles, but investment has clearly declined. In fact, this new chart appears to confirm Yglesias' point, that capital expenditure hasn't grown massively as NCTA suggested (and that's because... it hasn't). 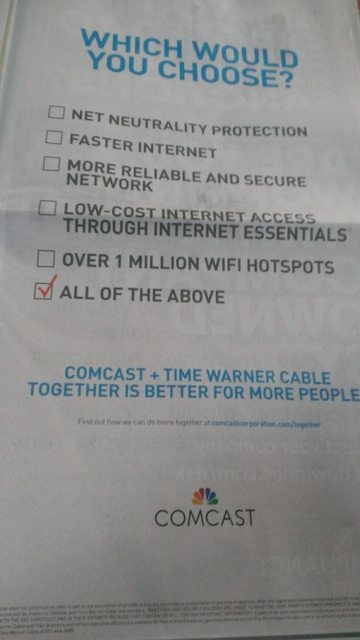 Oh, and Comcast's now even got the gall to argue that allowing it to merge with Time Warner Cable will mean more net neutrality protection and a "faster internet." It's putting those claims in big newspaper advertisements Of course, they're being misleading. It's what they do. They're defining "net neutrality" very narrowly, based on the merger terms that were forced upon it when it bought NBC Universal. But that's got little to do with the actual net neutrality issues of today. As for a "faster internet" they mean, yeah, sure, if internet companies agree to pay extra (meaning you'll pay extra too). I'm not exactly sure what the cable companies think they accomplish with these kinds of easily debunked claims, but it really makes them look excessively desperate. It wasn't an "unwritten deal." Until the Cable Act was reformed, it was the law. Congress and the states made the decision that the best way to deploy cable was to limit the number of providers to one and prohibited any other provider from building. The franchise authority was accompanied, not surprisingly, by considerable government delay and corruption. Because that's what happens when evolving industries are subjected to the well-meaning (or not) decision by regulators that they know best.